Oven-man is a Tamworth based oven cleaning company founded by two brothers, These two brothers can bring your oven back to that brand-new showroom shine at an affordable rate, These guys know their thing when it comes to ovens. 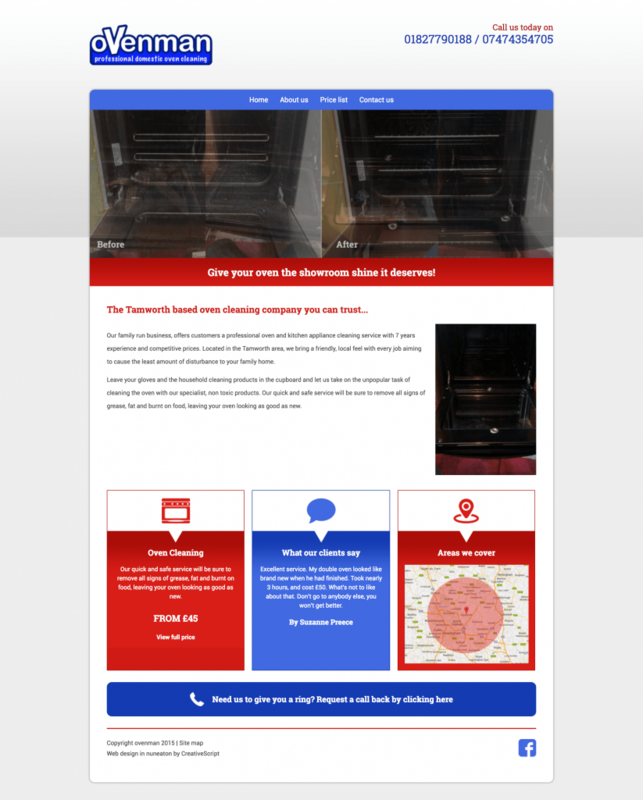 We provided oven-man with a 4 Page bespoke mobile responsive web site, running on a power CMS system. This website boasts a range of features including rolling banners, rotating testimonials, Call back form and price list. We designed the website to be simple to view across all browsers and screen sizes we achieved this with a flat design with simple colours with CSS Queries and Styling and to make sure it looks good on every screen meaning they can reach a broader audience and be accessible on any devices. We also wrote the content in house to give them best possible chance of being found on google. Love what we did for Oven-man? then why not drop us a line and we will be in contact for friendly, no obligation chat, Let us explain how we can help you.